In part 2 of this 10-part series on Fundamentals for a better game, I discuss Smash Factor. lt is for you to understand a) What Smash Factor is b) How it contributes to distance and c) something you can focus on to increase yours. First, smash factor is a mathematical calculation done after a shot is struck. It is simply the speed of the ball divided by speed of the club. This produces a number not to exceed 1.50 with a driver and in its most basic terms, describes the solidness of the strike. For our article, we’ll assume we are just talking driver, but smash factor applies to all shots. Smash Factor contributes to distance in a few different ways. 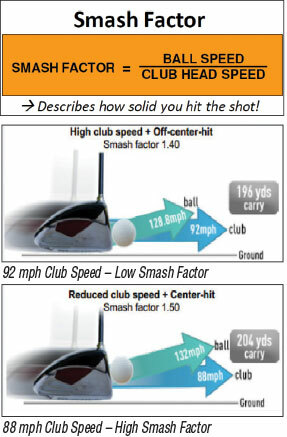 It can be said, assuming contact point & club delivery data stays consistent, that the higher the club speed gets, the closer to 1.50 the smash factor becomes. The largest variant to Smash Factor is contact point on the club face. Shots struck lower on the face or towards the heel will naturally produce a lower ball speed, thus driving down the overall Smash Factor whereas shots struck in the center, slightly above center or towards the toe will naturally drive up ball speed, thus increasing the overall Smash Factor. To consistently be maximizing the Smash Factor is a herculean feat. The averages across the PGA TOUR are with a Driver, 1.49 & 6 iron, 1.38. The average 10 handicap has a Driver Smash Factor of 1.45. This essentially means that due to inconsistent contact across the club face, the majority of golfers out there are leaving yards in the bag. To work on improving your Smash Factor, you first need to start gaining awareness as to where your miss on the driver face is. Where is the contact point of each shot? The best option to start learning your patterns is to use face tape on your driver or take Dr. Scholls spray and coat the club face prior to hitting the shot. This will mark the spot. You could also take a dry erase marker and place a dot on the back of each golf ball you hit. This would leave a small mark on the face. Knowing is half the battle with Smash Factor and if you want to improve yours, become aware of where you’re striking it on the face! Scott Sackett, GOLF Magazine Top 100 Teacher the past 14 years. Voted as one of Golf Digest’s Best Teacher in the State the past 21 years. Trackman Master Certification. Titleist Certified Club Fitter. Director of Instruction at Park Meadows CC in Park City, Utah and while in Scottsdale teaches private lessons at McCormick Ranch Golf Club and conducts all Scott Sackett Signature Schools at SunRidge Canyon Golf Club. If you would like to reach Scott, contact him through his website at www.scottsackett.com or email directly to scott@scottsackett.com.